Mesenchymal stem cells (MSCs) are progenitor cells, meaning they are cells that can differentiate and become other cells. In fact, they are the cells from which all other cells are derived. They are found in many adult tissues including the bone marrow, fat, synovium (joint lining), teeth, skin bone, and cartilage. Our preferred source of MSCs is umbilical cord tissue due to he universal donor status of these cells and the young powerful regenerative ability of this source. 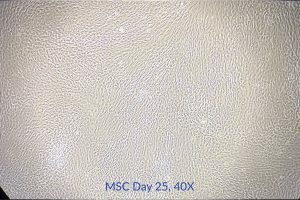 What makes MSCs unique is that when they’re cultured outside the body, they multiply quickly but don’t differentiate into anything specific until a unique stimulus is applied. What that means is that by culturing these cells, a large number of them can be grown in a relatively short period. The therapeutic and regenerative potential is obvious. 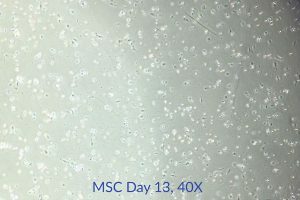 Mesenchymal stem cells are grouped between the term “multipotent” and the term “pluripotent.” The MSCs have the ability to produce a range of secretions such as growth factors, and poses the ability to differentiate into many different cell types. Embryonic stem cells are obtained from the fetus. Embryonic stem cells are “pluripotent” that is to say they can differentiate into virtually any type of cell. While this makes them almost ideal for tissue repair, there are potential problems. The first important issue is an ethical one that is still being debated in many quarters. The second is that while their power to differentiate is unquestioned, the ability to turn them off at the right time may be a reason for concern. We do not use embryonic stem cells at our facilities. Adult MSCs can differentiate into various types of tissue which make them valuable as a potential source of regenerative tissue for the treatment of conditions such as arthritis, degenerative disease and injuries. In fact, adult MSCs are often referred to as “repair stem cells”. Early passage MSCs also hold an immune modulation ability which make them our preferred type of stem cell for immune disorders, inflammatory disease and anti-aging programs. StemCells21 medical team work on the various factors that cause MSCs to home in different areas of disease and damage. Small proteins called chemokines apparently attract mesenchymal stem cells because these cells have receptors for chemokines on their surface. When a tissue is damaged or diseased, there is a release of chemokines which then travel via the bloodstream. When these chemokines attach to receptors on the surface of MSCs, they cause the stem cells to migrate to the site of injury. Also, other substances, called adhesion molecules, also present on the surface of MSCs play a role in cell migration to an area of injury. What is stem cell therapy and why umbilical cord MSCs? Stem cell therapy refers to the use of stem cells in a therapeutic treatment. Ageing is the decline of stem cells in the body which are responsible for regeneration. Anti-aging is possible by repopulating your regenerative stem cell pools with younger and optimised stem cells. In our opinion the younger acting the stem cell the better, but only in a safe manner. To follow both these aspects we select donor umbilical cord tissue-derived mesenchymal stem cells (MSCs). 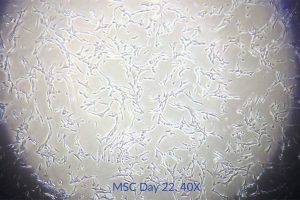 Umbilical cord MSCs are naive juveneille stem cells which holder greater regenerative capabilities then aged adult stem cells and also produce a unique portfolio of growth factors & RNA which support the stem cell rejuvenation process. Keeping the stem cells young is key to achieve real anti-aging. Many laboratories & stem cell treatment providers offer super huge numbers of stem cells for low prices, which may sound a great deal, but the efficiency of the stem cells may be compromised with mass expansion of the number of cells. In stem cell culture we start with a source pool of uncultured stem cells, we call this passage zero (P0). These P0 MSCs as young as we can obtain without the use of embryonic cells. P0 cells are then put into a culture to expand their numbers to achieve a therapeutic amount of cells. These cells can be grown to reach huge numbers into the billions, however each time the cells divide (cell doubling) they replicate their chromosomes which in-turn shortens their telomeres. 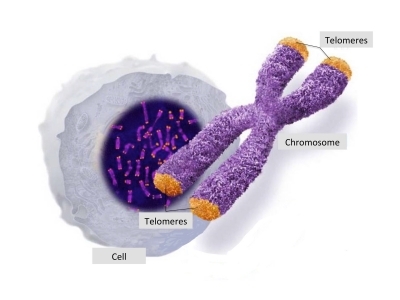 When telomeres become too short the cell will go into senescence and no longer be able to function. During this forced cellular ageing which occurs during cell culture the stem cells beginning to loose their levels of function such as reduced growth factor output levels slower differentiation ability and reduced immune modulation abilities. At StemCells21 we limit our stem cell cultures to only reach passage one (P1). Stem Cells in P1 culture have undergone on average 6 to 8 doublings and maintain their juvenile characteristics. These P1 MSCs are robust optimised stem cells which are secreting large amounts of growth factors & RNA, primed for self renewal (expressing 70%+ DNA expression of cell cycle phase G0-G1) and in their peak of immune modulation ability. In general other stem cell labs we have reviewed continue the culture expansion into passage 3 or 4, this means the cells have doubled around 30-40 times. The cells would be aged and in many cases unable to self renew anymore. This in our opinion defeats the purpose of regenerative medicine if the cells being given to a patient can no longer repopulate and have reduced functions much like a middle to elderly aged person. Maintain the Youthful Qualities of the Stem Cells: to achieve a therapeutic number of stem cells all laboratories put the unexpanded population of MSCs (passage 0) into culture to increase their numbers. However, when the stem cells double in numbers many times they begin to loose their abilities and in a way age. At our laboratory we restrict the number of doublings to have a limited of 8 to 10 times. Many laboratories or treatment providers will allow a doubling ratio of well over 30 time to obtain higher numbers of cells, as many treatments are sold per million basis. The over expanded cells loose their abilities such as growth factor production levels and become unable to repopulate in-vivo. Administration/Injection Routes: A combination approach is recommended giving cells intravenously for systemic delivery and locally via injections which can include: intramuscular, intra-articular, intra-dermal, lumbar puncture (into CNS), intranasal. Stimulation of Stem Cells: there are various ways to direct or stimulate stem cells towards a certain fate. These mechanisms include: mRNA molecule injections, laser stimulation with specific wavelengths (red, green, blue, yellow, IR) and nutrition/amino-acids. How do stem cells actually work? The most commonly known role of stem cells is their ability to develop into different organs cells but they also have other properties that can be very important for healing. Stem cells produce over 30 kinds of growth factors and tissue chemicals that initiate the healing process in the body. Stem cells help assemble other local and systemic mesenchymal stem cells to focus on repairing damaged tissue and organs. They are also active in immune modulation to support or suppress T-cell work in the body. Stem cells are stimulated to travel into an area by signals from the organ depending on chemical, neural, and mechanical properties. Under ideal conditions mesenchymal stem cells would respond to damages and healing would occur. Factors that affect stem cell response include fitness of the patient, age, and the level of free radicals in the body. Serious disorders such as heart and lung disease, high blood pressure, spinal and neurological injuries, diabetes type 1 and 2, adult macular degeneration of the eye, Parkinson’s disease, osteoporosis, are just some of the stem cell therapy applications that have already been employed, and in many cases, with dramatic results. Research has also shown that stem cells can be used to manage aging in individuals and make them appear younger. Mesenchymal stem cells play a vital role in regenerative stem cell therapy of many degenerative and life threatening conditions. They have a wide range of potential therapeutic applications. Aid to repair damaged cardiac tissue following a heart attack. Cardio myocytes have been used to control many threatening heart conditions. Generate nerve and brain tissue.They very essential in neurosurgery. Repair muscle tissue. They can also be used to control various types of arthritis. They can generate cartilage, which would have an important role in the treatment of arthritis and joint injuries. 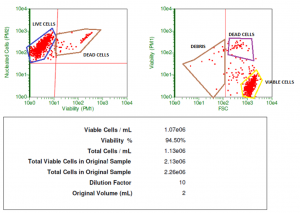 A passage number is the number of times a cell culture has been subcultured. This means that when we initially extract the MSCs from the umbilical cord tissue we have a starting population of stem cells called passage 0 (P0). These P0 cells are then placed into culture to expand their numbers which is a sub culture. The first sub culture is called passage 1 (P1) and we would generally expect the cells to have a 6 to 8 doubling rate inside this P1 culture. All batches of P1 MSCs are tested for their phenotyping and viability. The CD system is commonly used as cell markers in immunophenotyping, allowing cells to be defined based on what molecules are present on their surface. Mesenchymal stem cells have a distinct set of surface markers which is used for their identification and quality control. Cell viability means the health of the cells. For stem cell therapies, it’s critical that the stem cells you’re receiving are viable (healthy).